Updated cottage originally built in the 1920's. This cottage rests as close to the water's edge as you can get. Fully furnished and beautifully maintained. This cottage has all the necessities you need including a washer and dryer! Easily accessible from US RT 1. Walking distance to downtown Wiscasset shopping and dining. Seasonally available, May to November. Cable television and wireless internet included. Daily professional housekeeping services are provided for an extra fee if requested.This cottage is pet friendly! 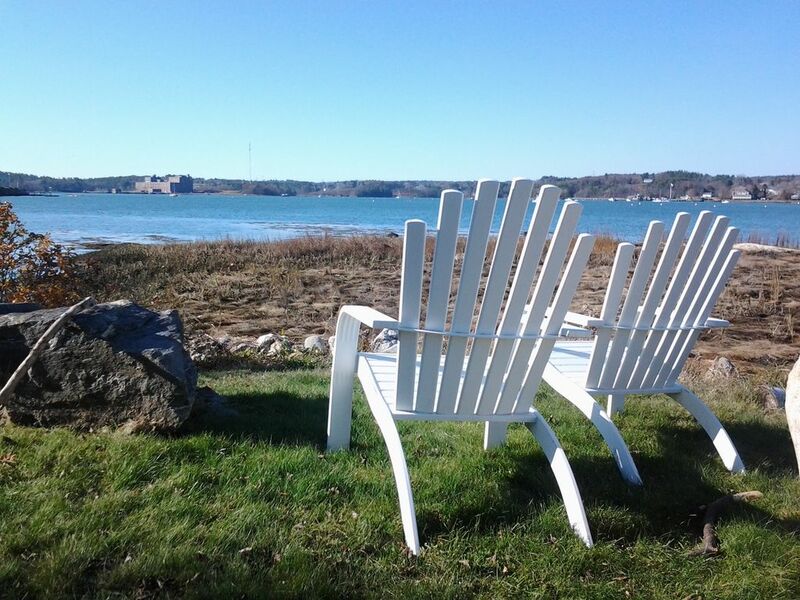 Sheepscot Harbour Village & Resort is an upscale community of privately owned condos and cottages. On the banks of the Sheepscot River, this cottage basks in the sunset's glow over Wiscasset Harbor. Watch the lobster boats gathering traps of sail boats out for a cruise. Private charter available. Queen bed is made. Extra bedding for pullout sofa are provided in closet. Four bath towels, four hand towels, four wash cloths and a bath mat are provided. Counter-top toaster oven and two burner Ceramic portable cooktop. This room looks out over the waterfrontage with three large windows. This room can be closed off from rest of cottage with large french doors. The cabin is quintessential New England. Clean and adorable. The views - wonderful!! Close to everything but quiet. Spectacular views. Cabin is lovely!! The Cottage was beautiful, Very Clean, and everything was in good working order. The Resort is very neat, with a great view of the water and the bridge. The area is very nice, quiet but not isolated, just right. The arrangemens for the rental were easy and clear. Thank you for sharing your cottage with us, we would absolutely come back in future trips. Property and view was gorgeous. Missed not having a stove, but the hotplate and microwave were sufficient for our Honeymoon! We truly had a wonderful time. My husband and I had to vacate our house in Portland for a night due to insulation being blown in the basement. We rented this quaint little cottage just north of Wiscasset and it was a lovely evening. The one bedroom cottage was clean, set in a beautiful location right on the water (you could hear the wake splashing on the rocks from the bedroom) and close to many shops and galleries in Wiscasset. The cottage was in a great location - close to Wiscasset and Bath and all the cities up the coast of Maine. And it had a most beautiful river view. It was a very nice community of cottages - pleasant to walk around for adults (and dogs.) We would definitely stay there again. We only stayed here for one night but for our first night in Maine it was the perfect experience. Cabin is very clean, Well appointed and very comfortable. this would be a perfect location to set as a base camp to do day trips as you explore all the surrounding areas. highly recommended . So many activities are available at your doorstep! Enjoy sightseeing in close by Wiscasset. Walking tours of Historical homes and haunted history. Maine Maritime Museum in Bath is a must see. Here learn of Maine's rich maritime history. You will also observe on your way, the working shipyard of Bath Iron Works building Naval Ships. Not far from Bath is two beautiful State Parks. Fort Popham State Historic site can be toured free of charge. Also, the 529 acres of Popham Beach State Park is a wonderful place to relax and spend the day beachcombing and resting. Reid State Park is another beautiful attraction with several sand beaches and a rocky climbing area with tide pools to explore. The Boothbay Harbor Region is a 10 minute drive from the cottage. Known for it's tall masted ships at Windjammer Days, Boothbay Harbor is a fabulous destination for shopping, dining and boating. Take a harbor cruise or whale watching expedition from one of the piers. The Coastal Maine Botanical Gardens is 248 acres of gardens with a mile of waterfront on Barter's Island Road. You can make a day of this trip hiking along the property and dining in the cafe. The Pemaquid Point area shows off Maine's beautiful rocky coast. Visit the lighthouse and gallery there. A short drive away is Pemaquid Beach Park. A great smaller beach for chlidren to run and play. The summer months are not the only time to vist! All year there is gorgeous scenery. Maine has great skiing also. Closest is Lost Valley, just an hour drive. Sugar Loaf is about an hour and forty minute drive. The season can start in early November and last til early spring. Wherever you find yourself travellig in Maine you will have plenty to do. At the end of the day you will have a clean, cozy cottage to come home to!